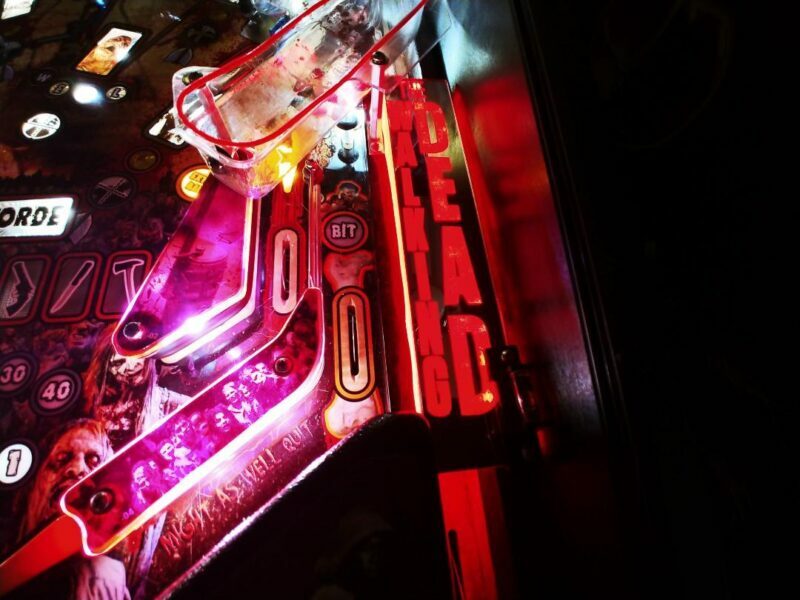 Light up your pinball machine's hinges with an amazing lighted enhancement! This mod is one of the easiest mods you will ever install. The Lighted Magnetic Hinge Covers are custom cut to fit exactly the size of your hinge. The Lighted Magnetic Hinge Covers come in a variety of colors, and come as a set of two to cover and augment both pinball hinges on your machine. They use an adjustable light sensor that configures your pinball Hinge Cover lights to come on and go off automatically with your machine! 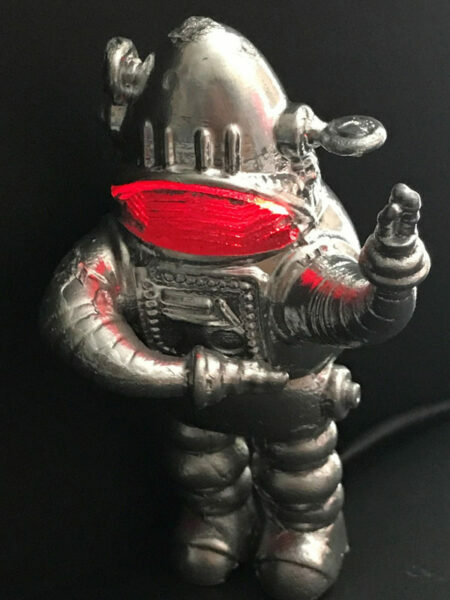 ​​​​Light up an area of your pinball machine that is always overlooked. Our Lighted Shooter Covers are full RGB with remote, giving you over a million colors. The top is either in a mirror finish or black matte. Not only does this illuminate the name of your game on the top, but also gives a cool illumination in the shooter area. Another original and exclusive pinball machine mod from Lighted Pinball Mods. Our exclusive Plasma Pop Bumpers are one of the most dramatic mods you can purchase to enhance your game. Designed to work in nearly every manufacture of pinball machine with an easy installation process, just a bit more work than changing a pop bumper cap. The Plasma Pop Bumpers can always be on, sound activated or turn on and off as your original pop bumpers would. 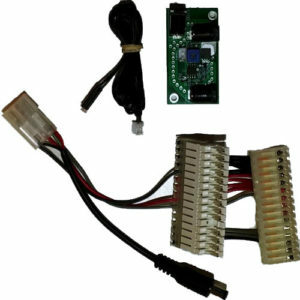 Over 18 months of design and over 1 year of play testing, designed for durability with a high impact resistant epoxy and zero power conflicts or power supplies issues. They were the most talked about mod at the annual Allentown Pinball Expo of 2017. These pop bumpers pinball mods will not only last the lifetime of your game, but they will make lightning in your game COME ALIVE! 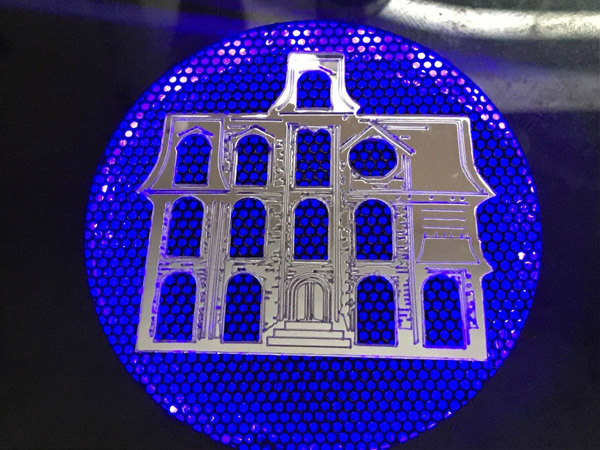 Our Lighted Pinball Speaker panels look so amazing in your game that it will leave you wondering why it wasn’t already created that way by manufactures. With over 2 years of design and 100 prototypes you and your friends will be amazed at how well these integrate into your game. Each panel is designed to work with your game. With over 15 hours of hand crafting they look flawless. The Lighted Pinball Speaker Panels bring life to your speaker panel artwork and give your speakers light that has never been available on these games. Three panel options from our basic white panel to our ultimate panel that gives you choices of thousands of colors using a remote control for your panel and speakers. This is one of the few pinball modifications that match the game perfectly and are just as visible while playing the game as they are from across the room. With our optional sound activation system, you can have your panels, speakers or both come alive with sound activation. Our store boasts over 200 original play-field mods that are created and manufactured in our state-of-the-art shop. 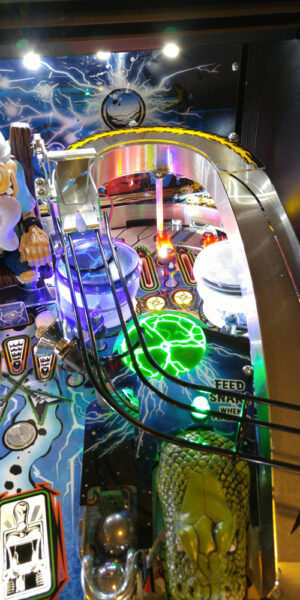 Our play-field pinball mods look amazing inside of any pinball machine. We make sure that our mods are as detailed as possible and are specifically designed to reproduce the images that are on the playfield, translite, or display. We use many systems to color the mods and use a wide variety of LED lighting systems to give your mods a seamless fit into your game. We strive for excellence so we’ve created an improved mounting systems that gives you as much flexibility in mounting and installing your mods yet make it as easy as possible. All pinball mods come with a convenient lighting system that is as easy to install as changing a light bulb. Original instructions cardsare generally simple and boring affairs that only stand out because their plain nature contrasts to a machine that is otherwise covered in detailed artwork. 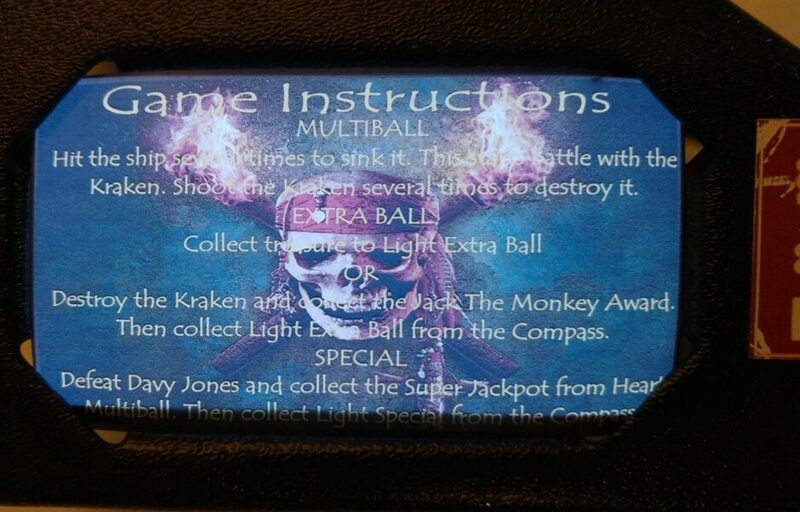 Sure, they get the job done when it comes to providing a quick list of rules, but certainly more can be done to make Instruction Cards look great in a modded pinball machine. Introducing our exclusive Electroluminescent Glowing Instruction Cards (EL Panels)! Using the latest technology in Electroluminescent design, you'll want to convert all of your games over to bring some attention to an area that is often overlooked. Pictures do not serve proper justice on how incredible and professional our Electroluminescent Glowing Instruction Cards look in person. Rest assured that your pinball machine will look more remarkable than ever once they are installed. Pinspot Graphics is a very small high-powered focused gobo projector that will project an image on the upper wall above your game as a topper. You also have the option to project on the floor under the game or at your feet. You can also project the image on your ceiling or even project on a wall. It is amazing that new look this give your game. Any way you position your graphic is incredible. It adds an entire new dimension to your pinball panorama. You can run multiple projectors per game, one on the floor and one on the ceiling as an example. If you want to customize your look more using our optional phototsensor relay, you could make you Pinspot Graphic turn on and off from ANY light in your game!! Pinspot Graphics Pinball mod is our custom 4 lens gobo projector system that is under 1 1/2” long (3.8 cm) and about 1 ounce. With our 4-lens system and lighting systems, it automatically focuses at any length. Our 4-lens projection system is designed in a black aluminum casing with a 180-degree pivot mount which can be easily be pointed in any direction. You will need to use a Philips head screwdriver to secure your desired angle. Because of the low weight, our Pinspot Graphic can be mounted under your pinball cabinet with supplied Velcro. This makes for very easy installation. Hundreds of images available. Great looking WPC and WPC95 Lighted Speaker Kits for Bally and Williams pinball machines using your original speakers or after market speakers. There are reasons why you could never find Lighted Speaker kits for your Bally/Williams games that looked as good as the speaker light kits for Stern’s or the new Chicago Coin’s remake of classic Ball/Williams games. Bally/Williams used a midrange speaker, which is large, and a tweeter that is small, giving a very unbalanced look to your game when lit up. In the past there was no way to make both sides look nearly identical till now. The two main features about our Lighted Speaker kits that separates them from all others is that our kit gives you a cut out that is the same on the left and right. Second, is the mount for the smaller tweeter appears to be the cone of the larger midrange. These pictures are using your original stock speakers, but we also have kits that will allow you to have this great look with aftermarket speakers such as Flipper Fidelity or Pinballpro. Our Plexiglass Is an easy dress up on your bland speaker area with our mirrored Plexiglass accessories. The design with magnets on the back takes seconds to install, it’s that simple. They are available for a wide variety of pinball games and are a beautiful accent with our lighted speaker panels as well!